I don’t remember how old I was when I first discovered foreign languages. My older sister went on an exchange visit to Stuttgart, Germany, when she was fifteen, so I would have been around six years old when she came back, introducing me to Nutella, and to the German phrase “ich liebe dich”. Although I went to a school full of kids from different countries, if I ever heard other languages it would have been as an impenetrable barrier, not something that I could actually learn. Thanks to my big sister and her travels, I now knew a foreign phrase and could say it, “ich liebe dich”, “I love you”. She probably learned it from a boy that she met. I like to think that “ich liebe dich” was a good place to start. I didn’t really think much about foreign languages again, until I got the Mexico 86 Panini World Cup sticker album. As a ten year old boy, I was obsessed with football. It’s all I would talk about, think about, dream about (I was pretty much over Transformers by this point). Swapping stickers on the school playground was the highlight of the day. What I really liked about the Mexico 86 Panini World Cup sticker album, apart from all the funny names and wacky beards (I’m looking at you, Hungarian goalkeeper Peter Disztl), was that there was a list of every country, even those who did not qualify, in its own language. It was a list of exotic lands like ‘Deutschland BRD’, ‘Magyarország’, ‘Shqipëria’, and the confusing ‘Helvetia’. Some were almost like the name in English, just a little different, such as ‘Brasil’, ‘Turkiye’, ‘Italia’, ‘Danmark’. The countries themselves were not alien to me. I had been reading Atlases since I could read, and used to draw maps of the world for fun, but seeing them listed in their own languages was mind-blowing. And then, in the middle of the World Cup, my family and some of our neighbours all went on a package trip to sunny Spain. It was my first time outside England. I had been to Norwich, which doesn’t look far on the map but actually takes ages to get to, and linguistic differences only stretched as far as my cousin saying “int’ it!” instead of “innit!”. To prepare for this foreign adventure I bought myself a Spanish phrase book from the Salvage Shop in Burnt Oak. The Salvage Shop was the most exciting place in town, you could get anything there. Well they had some cheap phrase books and I spent whatever it was, 50p maybe, and suddenly a new world opened up. It included a smattering of Spanish phrases, but was mostly a word-to-word dictionary. Naturally, my friend and I went through the book looking for the ‘funny’ words. It didn’t include any swear words, more’s the pity, nor any words like ‘fart’ or ‘bum’, but it did include the hugely hilarious words for ‘drunk’ (‘borracho’) and ‘hangover’ (‘resaca’). We knew full well what those words meant in English having observed our parents at parties over the years, and in fact on the first night in Spain, our dads went out and got quite ‘borracho’ indeed, very much ‘resaca’ the next day. In fact my mum locked my dad out of the apartment as a result, meaning he spent the first night in Spain sleeping on the sunbed by the pool. If any Spanish locals were not familiar with English swear words before that night they were probably quite familiar with them afterwards. Dad would always tell me that those swear words were also a different language, ‘Anglo-Saxon’, and for a few years afterwards I probably still believed that. Apart from ‘borracho’ and ‘resaca’ I must admit I didn’t pick very much else up, except for a few numbers, the Spanish word for toilets (‘lavabos’ and ‘aseos’, because of course we looked those up), and the incredible discovery that some chocolate bars have different names in other countries, such as ‘Raider’ (foreign for ‘Twix’), and ‘Snickers’ (foreign for ‘Marathon’; that will never catch on, I said at the time). I never did learn Spanish, in fact, despite going back to Spain for every single remaining summer of the 1980s. Holiday resort Spain isn’t really Spain, though, being full of English people getting ‘borracho’, and the foreign language I heard most was usually German, in the swimming pool. When I moved to secondary school though, I finally got to learn a foreign language – French. British people of a certain age will know what I am talking about when I say the words ‘Tricolore’ and ‘La Rochelle’. Say no more. I finally visited La Rochelle in 1998 on a rail trip around Europe and yes, it was exactly as I remembered in the famous school textbooks. French was fun, but in the second year I finally got to learn German. At twelve years old I was becoming a lot more interested in different languages, and I loved German. It quickly became my best subject, but I wanted more. I would sometimes go to the library and look through any books teaching foreign languages, to the best of my abilities – usually “1,000 words in Italian” or similar picture books, not really picking a lot up. And then I discovered Berlitz phrase books and dictionaries – small pocket sized books with, as far as I was concerned, everything I needed. 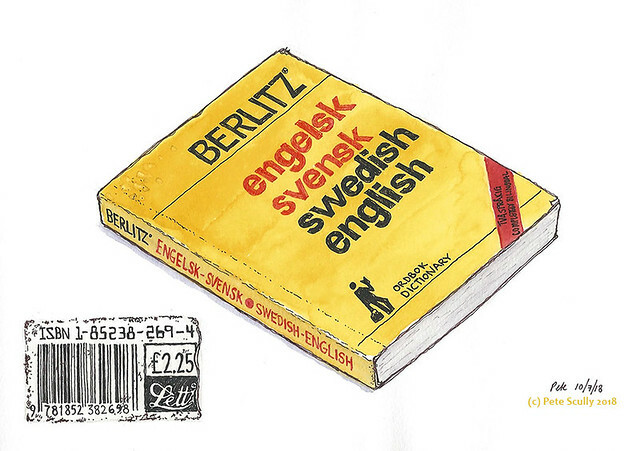 The first one I bought was a yellow-covered Swedish dictionary, bought from a now-gone bookshop on Burnt Oak Broadway. It cost £2.25. I think I was thirteen, and I’m sure part of my motivation for wanting to learn Swedish was ‘girls’. I just loved the way the language looked, and sounded, and all those little dots over the letters, and the little circle they sometimes put over the ‘a’, and even the word for ‘dictionary’ itself – “ordbok”, which my keen detective mind deduced must mean “word-book”. Around this time I would start to explore London. Sometimes I would get on the tube and go into central London looking for records, but usually, on Saturday afternoon, I would get on a bus and got to Harrow-on-the-Hill, to the bookshop at St. Anne’s, and spend literally hours sat upstairs in the languages section. It would be pouring with rain outside, and I was sat in the corner, reading the ‘Berlitz European Phrase Book’. I wish I still had that book, but I left it with my nephew when I moved to America. I read that book more than any other. It covered fourteen European languages: French, German, Spanish, Portuguese, Dutch, Italian, Danish, Swedish, Norwegian, Greek, Serbo-Croatian, Polish and, most exotic of all, Finnish and Russian. The Big Fourteen, as I thought of them. There was no Czech, that remained too exotic, no Romanian or Bulgarian (how excited was I when I discovered how Romanian was more like Italian and French), and Ukrainian was a language I didn’t even realize existed back in the pre-Soviet-demise era. I started spending my Saturday afternoons in the biggest local library, Hendon, devouring their language section, getting out books about Albanian or Afrikaans, drawing little Indo-European family trees, attempting (and failing) to figure out how to pronounce Irish words. I did German and French A-Levels and ended up studying French at university, where I must admit my progress in languages started to flounder, as it got a bit hard. I was better at drama. I did do foreign language plays though, acting in several productions in German (including Romulus der Grosse by Friedrich Durrenmatt in which I was covered in fake blood with a Luke Skywalker-esque mechanical hand inside a stage built to look like a chicken coop full of feathers) (that was fun). In the end though I got my French degree and was selected to go and teach in Aix-en-Provence, where I continued to be bad at French to new levels, but it’s where I met my future wife, who was impressed at my ability to converse in three languages simultaneously at the pub, albeit not necessarily to the right people. My love of languages took me abroad to Aix which ultimately took me here to California, where my wife is from, and so you might say that in a roundabout way this little yellow Swedish dictionary is why I am here in Davis right now. But that is a bit of a stretch. I still have the book though, and here it is (scroll back to the start). I haven’t done any language learning in a long, long time (though I did get a Masters in Medieval English), but I still love the subject. And I still collect World Cup sticker albums. But I never did learn very much Spanish. Or Swedish, for that matter.